Boasting almost 100% soft, natural snow, Sunshine Village is renowned for it's lengthy ski season from mid-November until late May. Located just a 20 minute drive from the world-class resort town of Banff, skiers and snowboarders can hop aboard the Sunshine Village high-speed 8 passenger gondola and arrive to over 3,300 acres of stunning alpine terrain in under 20 minutes. Located at the top of the Continental Divide, the majority of the terrain at Sunshine Village is above 7,000 feet, far above the hustle and bustle of the valley below. The resort features 12 different lifts including 8 super lifts, a high speed gondola, 3 different mountains to explore, and the novel opportunity to ski or ride in both the province of Alberta and British Columbia on the same run! 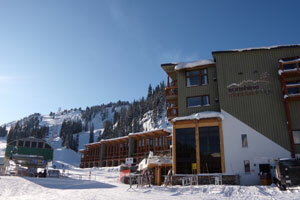 Stay at Sunshine Village in the Sunshine Mountain Lodge (formally known as the Sunshine Inn). This ski property is the only ski-in, ski-out on-mountain accommodation in the Banff area. Contact us for more details or to book as we have the lowest rates. The Tri-Area Lift Pass covers Banff Norquay, Sunshine Village and Lake Louise. The Ski Shuttles from Banff and Lake Louise are included in the ski lift pass. Pre-book your ski lift passes through us as part of a ski package and kids ski free or receive 10% off your Adult ski lift passes.